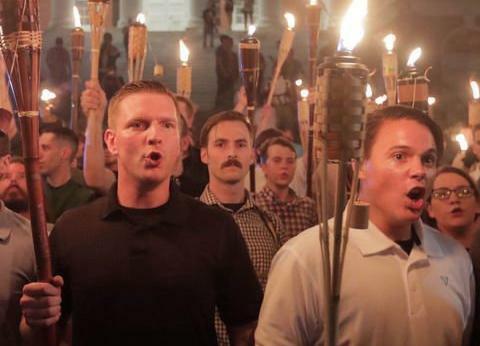 Matthew Colligan (center with mustache) marched through the grounds of the University of Virginia in Charlottesville Friday night. The photograph is as chilling as it is unforgettable: a sea of young white faces, lit by torches and inflamed by hatred. The picture was taken in Charlottesville, Va. But the hate? At least some of that has its roots in Boston. When Dicky Stock first saw that now-infamous photo from last weekend’s violent rally, a face jumped out at him: The mustachioed guy in the second row was unmistakably his former Brighton neighbor and onetime friend. That, he knew instantly, was Matt Colligan. “I considered him a friend,” said Stock, a comedian who now lives in Los Angeles. “He would come over and drink beers on our porch with us.” That was in 2011, and there was no inkling, Stock said, that his neighbor, who has spent the last several years living in and around Boston, would become one of the most recognizable faces of a white supremacist movement. On Twitter, where he is known as @Millennial_Matt, Colligan cultivated an insipid notoriety, palling around with a right wing “comedian” known online by the nom de idiot Baked Alaska. The poster known as @Millennial_Matt once compared Auschwitz to a five-star resort and devoted a lot of time to trolling the right-wing men’s group the Proud Boys, evidently for not being far enough to the right. In Charlottesville, Colligan pulled the same stunt with Elle Reeve, the Vice correspondent behind a searing documentary about last weekend’s unrest. As he blurts his Holocaust denial, Reeve appears to realize what’s happening and dives out of the picture. Until Stock outed him, Millennial_Matt was another anonymous Internet troll, spreading hate without consequences and saying increasingly outrageous things to get a rise out of people. How much of his shtick is trolling for attention and how much was deeply held racism is impossible to know, if that even matters. Many a racist has sought to obscure his ideology in a cloud of LOL JKs. But once you show up among the chanting, torch-bearing crowd, then you own the full-throated white supremacy that comes with it. In liberal Boston, Colligan could blend in — another skinny, white, twentysomething Allston hipster with a silly mustache. But if you believed the audience for white nationalist speakers at Saturday’s “free speech” rally in Boston would be coming from someplace else, consider Matt Colligan. Colligan did not respond to requests for comment through various channels. But his Instagram account, “allstonninja,” confirms that Colligan and Millennial_Matt are one and the same. Several of the same photos appear on both the Instagram account and Millennial_Matt’s Twitter account, though the allstonninja is largely devoted in recent years to (I swear I’m not making this up) selfies taken with a hairless cat named Igor. “Allstonninja” at one point also posted what was plainly his own driver’s license photo. He cropped out his name but not his birthdate — a birthdate that RMV records show matches Matthew Colligan’s. Colligan’s current address isn’t listed, but his driving record and Instagram photos suggest he remains in the Boston area. Though he initially had some reservations about outing his former friend, Stock decided to identify him on Facebook as the man in the Charlottesville photo. Freedom of speech isn’t freedom from consequences, and the same Constitution that gives Colligan the right to shout his Holocaust denial and march alongside neo-Nazis gives Stock the right to tell the world who he is. Soon after though, others posted phone numbers and addresses for Colligan that were either outdated or incorrect. One home address that circulated had belonged to his mother years ago; a man in Illinois started getting death threats on his cellphone, which a database had incorrectly linked to Colligan. After initially responding with taunts — he posted what he said was his “real” home address, the site of a Jewish temple in Boston — Colligan soon turned serious. In a video posted on Twitter, Colligan pleaded for the future of the country he’d been helping to tear apart. Millennial_Matt is gone now. Not long after I reached out to him for this column, he tweeted that he had received death threats police deemed credible, and wrote that his family was in danger. Then he abruptly deleted his Twitter account. Police in the town where his mother lives said they were aware of the situation but did not confirm the specifics. Publicly, at least, it was the first true thing he’d said in a long time.